Bryan Barton Collier of Vale of Skelmersdale Lodge No 8719 and Stanley of Bickerstaffe Lodge No 3511 celebrated 50 years in Freemasonry at special meeting held by Vale of Skelmersdale Lodge, at Ormskirk Masonic Hall. Bryan had been initiated into Beacon Lodge No 6072 on 2 December 1968. Frank Umbers (left) presenting Bryan Collier with his jubilee certificate. The celebration was led by Assistant Provincial Grand Master Frank Umbers who was accompanied by the group chairman Graham Chambers and three grand officers; Brian Fairhurst, Tom Norris and Malcolm Alexander. Also, in attendance were three acting Provincial grand officers; Jason Dell, Russell Morris and Garry Norris. Frank opened his address by saying how honoured those present were to have this opportunity to join in the celebration and to mark the golden anniversary of Bryan Barton Collier. Bryan was then placed in front of Frank by the Provincial Deputy Grand Director of Ceremonies Jason Dell. Frank continued by remarking that it had been a pleasure for him to spend time with Bryan and for the detail he provided for him for tonight’s celebration. Bryan was born in 1937 and in that year ‘Sellotape’ was invented and became available in shops. It quickly replaced string for wrapping parcels. During the Second World War it was seen on widows to reduce the risk of flying glass. In the same year Frank Whittle did the first jet engine tests. It was also the year that the Dandy comic was first published. More importantly in May 1937 at 30 School Lane in Skelmersdale, Florence and Joseph Collier were blessed with the birth of their son Bryan. On the same day in the world 282,000 babies were born. Bryan has an older sister Brenda, who was born in 1934. Bryan’s father was a miner at Clock Face Colliery in St Helens, owned by the long-established Wigan Coal & Iron Co Ltd. He then went on to work in the food processing and dehydration factory in Skelmersdale, known locally as the ‘Spud Factory’, before becoming, until he retired a landscape gardener. Bryan’s mother, Florence, was a maid in service working for a gentleman farmer, Mr Pilkington, who owned Cross Hall, Aughton Hall and Sycamore Farms. Mrs Pilkington used to treat Bryan and Brenda like her own and he has some fond childhood memories. Mrs Pilkington took Bryan and Brenda to lunch and the pantomime every Christmas as well as giving each of them a savings bond to encourage them to save. Bryan was the envy of his mates when Mr Pilkington used to take him in his Daimler car to collect the milk. Bryan attended Barnes Road School up until he left at 15. On leaving school Bryan joined E H Bampton & Sons of Aughton as an indentured apprentice painter and decorator. During this time Bryan attended Wigan Technical College for one full day and two nights a week for the duration of his apprenticeship. In 1958 Bryan was called up for National Service. After completing three months basic training at Crookham in Hampshire, Bryan joined the Royal Army Medical Corps. The Royal Army Medical Corps (RAMC) is a specialist corps in the British Army which provides medical services to all army personnel and their families in war and in peace. Together with the Royal Army Veterinary Corps, the Royal Army Dental Corps and Queen Alexandra’s Royal Army Nursing Corps, the RAMC forms the Army Medical Services. After his training Bryan was posted to Waringfield Military Hospital in County Down, Northern Ireland, staying there for the duration of his service and gained promotion to the rank of Corporal. After his National Service, Bryan spent two years at Thomas Ryding’s & Sons in Ormskirk before going to work for Skelmersdale Urban District Council. This is where Bryan met up with his old school buddy Neil Pye. After Skelmersdale was designated a ‘New Town’ in 1961, Neil and Bryan took the bold decision to form their own business and the company of ‘Pye & Collier, Painters and Decorators’ was formed in 1963. It went on to be a successful company, providing gainful employment to a number of local painters and decorators over many years. The company completed every type of contract both locally and further afield. The company specialised in church interiors, completing work in St Paul’s Cathedral in London and other churches in Skelmersdale, Bickerstaffe and Westhead. Churches included Mossley Hill Covent Chapel and Lathom Park Chapel, which also included gold leaf on the ceiling. Such was the quality and high standards of the workmanship of his company that it won a number of awards. Bryan retired in 2002, aged 65, but the company is still going and is based in Westhead. Bryan travelled to many parts of the World and visited many interesting and varied places, including all parts of the Mediterranean, the Holy Land, the Caribbean, Canada, New Zealand and Australia. Bryan’s main hobby is the ‘sport of kings’; horse racing. Gardening has always been one of Bryan’s favourite pastimes which appears to be in the ‘Collier DNA’, with his father being a landscape gardener. Bryan has over the years played golf and crown green bowls, the latter of which he still plays. Bryan has been a member of St Paul’s Parish Church and for many years has served on the church council and being a church sidesman. Bryan is a trustee of Lathom Alms Houses and the Lady Lathom Endowment and Memorial Fund. On 2 December 1968, at the age of 31 after being proposed and seconded by Bob Heyworth and Clifford Pope, Bryan was initiated into Beacon Lodge and remained a member until its closure in March 2005. Bryan became a founding member of the Vale of Skelmersdale Lodge in December 1976, becoming master in February 1979. Bryan’s lodge duties also included nine years as director of ceremonies. After being a regular visitor for many years, in May 1988 Bryan joined Stanley of Bickerstaffe Lodge. In October 1986 in recognition of Bryan’s services to his lodges and Masonry in general, he received his first Provincial appointment to that of PPrJGD. In October 1994 Bryan received promotion to the very high rank of Past Provincial Junior Grand Warden, the rank he holds to this day. Bryan was exalted into the Stanley of Bickerstaffe Chapter No 3511 on 25 March 1972 and in March 1987 he became a founding member of St Michael’s Chapter No 5756. Bryan became first principal of Stanley of Bickerstaffe Chapter on 26 January 1989. Bryan’s first Royal Arch Provincial honour came in May 1993 as Provincial Grand Steward and joined the Provincial Grand Stewards Chapter of West Lancashire No 8516. Bryan was promoted to the rank of PPrGSwdB in 1997 and received the very high rank of PPrGSN in April 2008. Bryan is also a member of the Rose Croix Masonic Order. Frank concluded by stating that Bryan had set an example to all, with a life full of commitment, service to his country, hard work and success in his career and dedication to Freemasonry. 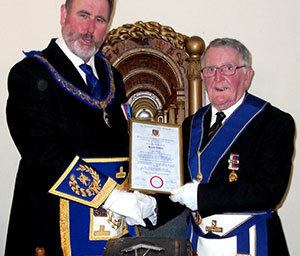 He then called on the group vice chairman Malcolm Alexander to read Bryan’s certificate issued by the Provincial Grand Master Tony Harrison to mark Bryan’s golden jubilee. Frank then presented the certificate recording Bryan’s 50 years in Freemasonry and wished Bryan the best of health to enjoy many more years both on his own behalf and all the brethren present. The brethren then retired to the festive board to enjoy a menu of smoked mackerel and prawn marie rose followed by roast turkey with sugar baked ham, traditional Christmas trimmings and vegetables. The menu was completed by warm ginger and treacle tart with white chocolate ice-cream. The raffle, on behalf of the MCF 2021 Festival, raised £151. Frank Umbers and Bryan Collier (centre) with the grand officers and acting Provincial grand officers.